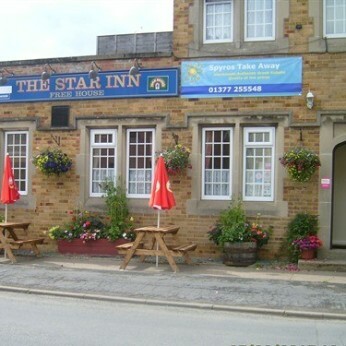 Located in Nafferton village The Star Inn is less than 1 mile from Nafferton Rail Station. The A614 is just 300 metres away. These 3-star quality rated chalets all have a private entrances, LCD-TV coffee making facilities and en-suite bathrooms with complementary toiletries, hair-dryer. A full English breakfast is served in the restaurant which is located in the main pub building across the courtyard. An extensive menu offers many traditional pub favourites along with some selected Greek dishes chosen by Spiros the resident chef. A full traditional Greek menu is available every Friday and Saturday evenings. On Sundays a traditional Sunday roast is served using all locally sourced produce. During the week The Star Inn’s darts and pool teams meet to play their league games. Free Wi-Fi is accessible in public areas and guests can relax with a drink or enjoy a game of pool or darts in the bar area. Local shops are within a 5-minute walk and the market town of Driffield is a 5-minute drive away. The seaside resort of Bridlington is a 20-minute drive away Whitby, Scarborough are all within easy driving distance .Cities of Hull and York are only 40 minutes away.